One of Delhi’s great monuments built by the British is not in Lutyens’ Delhi. Beyond the limits of the Walled City, in Kashmere Gate, St James’ Church doesn’t figure high on the sightseeing list. But it’s worth a visit. Unlike a few other Delhi churches, where the scale is too majestic, the surroundings here are intimate—almost like a neighbourhood chapel. But don’t be misled by the church’s apparent structural modesty. Its design is elaborate. The dome rests on an octagonal arcade and the circular space under it is where the congregation sits. Above the altar are two stained-glass windows—one on either side of the cross, depicting the crucifixion and ascension. Immediately below the communion table is the tombstone of Colonel James Skinner, the military adventurer who gave his name to the church. The son of a Scottish military officer and a Rajput mother, Skinner is known for the two cavalry regiments he raised for the British army in India. In 1800, lying wounded on a battlefield, he vowed to build a church if he survived. St James’ Church was the result. Its front row, once reserved for the Skinner family, is called Skinner’s Pew—you may still run into a Skinner descendant at the church. It is said that the land on which the church stands was once a mango grove owned by Mughal prince Dara Shikoh, who was killed by his brother Aurangzeb. Today it is mostly grass and gravel. On the north side is the Skinner family graveyard, where most of Skinner’s 14 wives and children are buried. The compound also has the graves of Britishers such as William Fraser and Thomas Metcalfe. 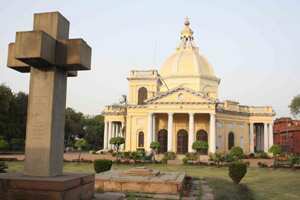 During the revolt of 1857, when hundreds of Britishers were killed in the streets of Delhi, the church was badly damaged. Its books were destroyed and records burnt. Later, when the British crushed the rebellion, a giant cross was installed in the church garden in memory of the dead. Where: Near Kashmere Gate Metro Station; Sunday church service: 8am (April-September); 8.30am (October-March).